Take a look at the complete Colonial Heights real estate listings below or continue reading about Colonial Heights and the area’s homes for sale here. Close to the community of Kingsport and Windmere, Colonial Heights is known for the high quality of life, good weather and reasonably safe neighborhoods. With a High School graduation rate that is 11% higher than the Tennessee state average and low cost of housing, the area is a good choice for families who are wanting own a home and to give their children the best start in life. As a small Tennessee community, Colonial Heights has a small population of approximately 3,500 people. Did you discover homes that you’d like to see again? Then register with the Byrd Home Team today. By signing up, you’ll be able to save your favorite listings, save your searches and receive notifications in real-time when homes that match your requirements become available on the Colonial Heights, TN real estate market. For families and working first-time home buyers, Colonial Heights’ real estate market will grace you with an abundance of options to choose from. From affordable character homes from the 1940s, to slightly more expensive, and expansive, homes that sprawl out over 4,000 square feet or more. One type of home you might find on the mid-range of the Colonial Heights real estate market is a stately brick home that will shelter even the largest of families in its 4 bedrooms and 4.5 bathrooms. Often found close to all the major amenities in town, a home like this tends to feature a remodeled kitchen area and beautiful traditional staircase, while still providing you an opportunity to personalize many of the rooms. Often situated on large lots of over a quarter of an acre, these homes have plenty of curb appeal and will enhance most family’s lifestyles. For home buyers in Tennessee who are looking for a bigger home, Colonial Heights’ real estate market has a handful of large homes. These larger homes have been known to enjoy a park-like setting and might even feature access to the community lake. Tall ceilings, wood flooring and bright, inviting rooms are just some of the wonderful features of these higher-end homes for sale in Colonial Heights, TN. Close to major routes, like Highway 81 and Highway 26, Colonial Heights is easily accessible to many major communities by car. 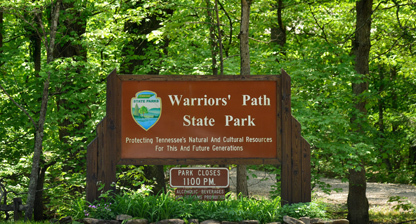 There are many local parks in the area including the Warriors’ Path State Park. Named after The Great Cherokee War, the park has a history filled with ramblers; a tradition that continues to this day. Home to great opportunities for avid anglers, boaters and hikers, the area is an outdoor enthusiasts dream. There is also an internationally-renowned bicycle trail and award-winning nature program in the State-run park too. Ready to find your next home among the available homes for sale in Colonial Heights? Start your search here or contact the experts at the Byrd Home Team.